It was a rather slow tremor. I was idly chatting with one of my colleagues in the spacious office on the 5th floor, when we felt this slow tremor started. “Whenever you show up at my desk, there is an earthquake. You are a bad omen.” he grunted. It’s true. A couple of weeks before, when we had been talking about the side-project at his desk, a fairly large earthquake hit. It was a slow swinging, at low frequency, deep but steadily increasing in its amplitude. It didn’t stop. “No, this isn’t funny.” He ducked under the desk. So did I. The whole floor, windows, ceiling, walls, cabinets, everything was making strange noise I had never heard before. Vibration was gaining momentum every second. It was around 14:50, March 11, 2011. Within an hour, the coast of Tohoku area was hit by the largest Tsunami ever recorded in modern history. And the Fukushima Daiichi Nuclear Power plant was washed by one of those Tsunami, which, TEPCO claims, caused power shortage and subsequent nuclear meltdown in its three reactors. That night, my wife and I felt strangely calm. We didn’t have running water in our building because the water tank had oscillated so hard that its joint had busted. Fortunately, we had electricity. We lay on the bed, fully awake, listening to the radio. It was continuously reporting the ever-increasing casualties from one village to another. At thirty minutes intervals or so, there was a report on the status of Fukushima Dai-ichi Nuclear Power Plant. But we didn’t understand what was going on. There was no fact, data or observation in the news. It was just repeating what the government announced. Like, warning to the people in the evacuation area in Fukushima. There was no way of knowing if staying where we were was safe or not. For next couple of days, TV, internet and other media were full of images of Tsunami. The helicopter shots chasing the Tsunami front was eerily etched on my nerves. A sheet of water steadily crawled through the rice fields, going over highways, gobbling up buildings and houses. These images did traumatize us. I heard some said ‘it’s like one of those scenes in movies’. I didn’t think so. In movies, such scenes would be at the top of its narrative tension, fully pumped up with soundtrack and cries of emotionally charged characters. Here, it looked like a part of grandeur scheme of universe, with no scenario. To this planet, it is one of its ordinary activities – like, rain, snow or wind. At the same time, most of us living in Kanto area were preoccupied with so-called “scheduled blackouts”. According to TEPCO and the government, the Fukushima disaster brought substantial shortage in electricity, so they needed to cut the power accordingly. They announced the most confusing blackout plans, which I thought were joke, but they weren’t. However, as for nuclear meltdown crisis itself, we had only bits of information. A series of the reactor explosions was captured on camera, but nobody knew what was exactly happening. The major media outlets, especially TV, were playing dumb, while the government and TEPCO were tiptoeing around their public relations damage controls. I remember the night I spent listening to the radio, anxious to know if the Reactors were melted to the ground. But nothing in the news. The radio was playing the Beatles on and on and on. Almost two o’clock in the morning. Already two reactors were busted. And I had to listen to “I Wanna Hold Your Hand” and “Eight Days a Week”. Something is screwy. Gradually, twitters, blogs and other web resources were filled with stunning facts, data and stories about nuclear disaster. Then, we realized none of major media, TV, newspaper or radio, did not report alarming news we should have known. We realized people in Fukushima had been exposed to incredible level of nuclear fallouts without knowing. Not only that, the whole Kanto area was (and still is) contaminated with radioactive Cesium, which would find its way into our bodies eventually through air, water and food. One of the most shocking stories was that of people stayed at the community center roughly 12km from Fukushima Dai-Ichi plant, without knowing the place was heavily contaminated with radioactive fallout. They were simply following the government’s order. The Japanese government determined the evacuation area based on the distance from the failed plants, which is nonsense. The wind and weather conditions are critical factors. The government knew their policy was flawed and they dispatched many technicians to set up the observation posts all over the Fukushima. A staff from Ministry of Education, fully equipped with a protective suit, was setting up one of those measurement post near the community center, was stunned to find people in such an area. “Please, please get out of here.” And he said it not as a government official, but as a fellow human being. People were buying radiation counters from Amazon, Rakuten or other internet retailers. I bought one, too, because my wife and I were building a new house (the project started before 3.11) and we needed to know how badly contaminated our new place was. We discussed what we would do if we found the ground was heavily contaminated. Are we going to sell it immediately? Or are we going to live in it with our fingers crossed (as if it helps)? What level of contamination is acceptable? We had become experts on radiation units and radioactivity, so we discussed these problems in microSv and Bq. On the night the box of a scintillation counter arrived from Amazon, we immediately drove to our construction site, placed it on the ground. Using a flashlight, I read, 0.04 microSv/h. It was way below than we had expected. We felt relieved. We had realized we would never get any reliable information from major media, let alone government and TEPCO. TEPCO, being the most influential customer to media and ad agencies, maneuvered the crisis, not the real one in Fukushima, but the public relations crisis. Scores of “nuclear-friendly” scholars and researchers showed up on TV or wrote columns on major newspapers, making somewhat ambiguous, but ultimately “reassuring” comments. Don’t worry. You won’t get cancer. It’s not as bad as it seems. Oh, really? Then, is it okay for three-year olds to live in the place where background radiation level is more than 0.6 microSv/h? That is used to be the radiation level for the “Restricted Area”, the area only certified personnel could enter. They are living in it. Kids are living in it. Their mothers are living in it. “To live” means to eat, to play, to bathe, to sleep and to breathe. Even the certified personnel is not allowed to do any of those things in the restricted area, except to breathe, maybe. And three-years olds are doing all of them. One day, I popped a DVD into my PC. It was the first of NEON GENESIS EVANGELION DVD set, the original TV series. I don’t remember why I have decided to watch NGE at that particular time. Then, as I progressed through the episodes, I found this image, which stuck in my mind and kept coming back. 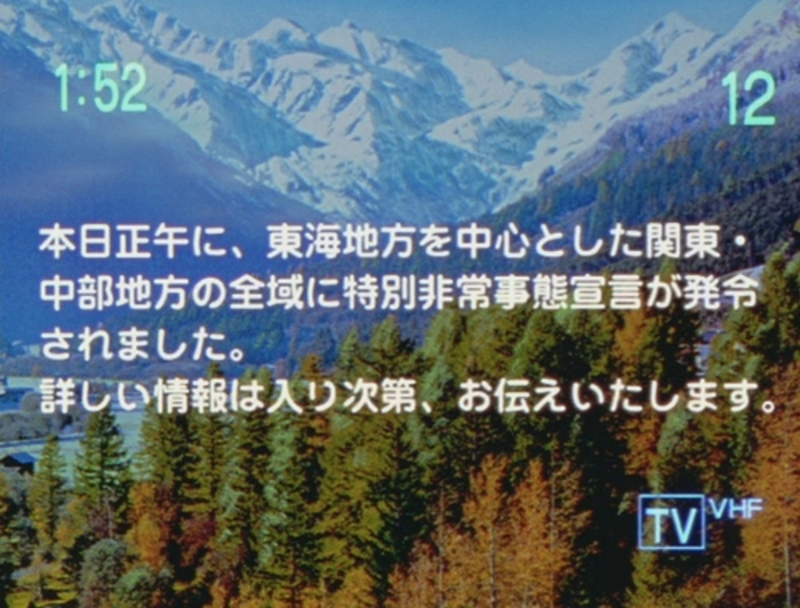 It was an image of the frozen TV screen, announcing the state of emergency. “We will report the detail information as soon as it is available.” And we know, they have the detail information, but they never release it to public. Look at that the peaceful-looking background. It’s as if that pastel-colored scenery could soothe our anxiety-ridden tension. That frame is frozen on TV screens for eternity while some catastrophic events are played out up above. I thought, I knew that feeling of being cheated. It feels familiar. It’s the feeling I got while the Beatles were played continuously in the darkest hours of the darkest night. Something is screwy, and it’s us. Then I realized something, something I had never thought of before. We have been trapped in the hall of mirrors, like the one in LADY FROM SHANGHAI. But these reflections are distorted with our own desires, fantasies about ourselves – power, recognition, pride – you might call it delusion. Then, bang! the bullet hole cast off the spell. Now I see the distortion. The world of Evangelion is the one we always wanted to (re)live – the world of catastrophe, a huge void in the center, but the chosen few to defend … defend what? We have a long history of this hall of distorted mirrors, and Evangelion is actually the descendant of all those before it, though the most introverted and problematic. We began building the hall of distorted mirrors back in 1941.